Last fall, Jeff Hanks, co-chair of the London Health Coalition spotted a giant teddy bear in Costco. 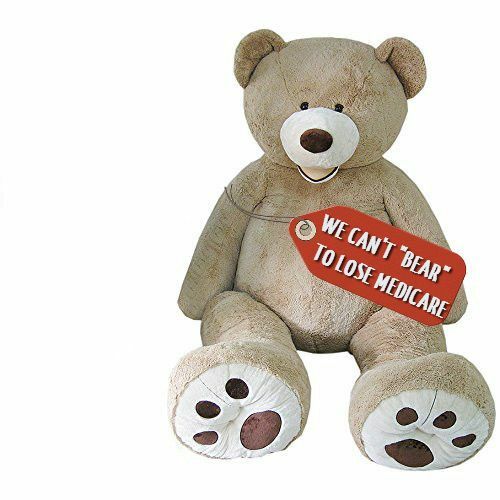 His idea, to create the slogan “We Can’t ‘Bear’ to Lose Medicare” and do a media event with it to educate the public about the threat of health care privatization was taken up by the Ontario Health Coalition. After a kick-off in London last fall and a special event in Sault Ste. Marie in the early spring, volunteers Peter Boyle and Don Arkell took the giant bear on a tour across Ontario. Natalie Mehra, OHC executive director, flew to Thunder Bay to join Jules Tupker, Suzanne Pulice and the Thunder Bay Health Coalition and a second giant bear that will be touring Northwestern Ontario this summer. Everywhere, the giant bear has been a hit, garnering dozens of media stories and helping with our public education initiative. Thank you Jeff for the great idea, and thank you all for coming out to the events in your communities! Atikokan Friday, August 11, noon, Town Hall, 120 Marks St.
Fort Frances Friday August 11, 4 p.m., corner of Church St. & Portage St.
Kenora Saturday, August 12, 10 a.m., City Hall, 3 Main St.
Dryden Saturday, August 12, 2 p.m. King St. & Whyte Ave.
Sioux Lookout Sunday, August 13, 2 p.m., Front St. & 5th Ave.
Nipigon Monday, August 14, 10:30 a.m., Township Office, 3rd & Front St.
Terrace Bay Monday, August 14, 1 p.m. Community Centre, Selkirk & Hwy 17. Marathon Monday, August 14, 4 p.m. Wilson General Memorial Hospital, Peninsula Rd.